From the opening line through to the last page this book is one of the most intimate and honest auto-biographies I have ever read. Issur Danielovitch Demsky was born in Amsterdam, N.Y. to a Russian born "ragman. "I still remember the ragman from my own neighborhood in Brooklyn, NY. He was a kindly,though somewhat mysterious figure. Imagine if that man was your father! 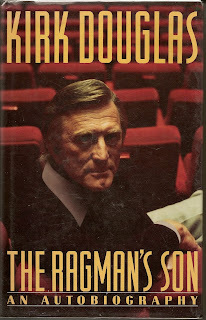 This book is the first of three that Kirk Douglas began in 1988. I have read all three. Follow Issurs'(Kirk Douglas) career through a childhood of poverty to his high school years and then World War Two. Honest to a fault about everything, including his own shortcomings, this book will draw you into his life and thoughts. His confrontations with anti-semitism and his growing understanding of what it means to be Jewish contrast starkly with his name change. This is a complex man. His movie years and 2 marriages are a good look at Hollywood and how it affects people and who they are. His insights into himself are what keep him searching for the meaning of all that has happened to him during his remarkable career. I have always enjoyed Kirk Douglas as an actor. and as an author he shines with a light unique to Issur, the small boy who makes it big.